Custom design means no cookie-cutter look-alikes. We avoid using web templates. Each and every web site we create is uniquely designed for our customers. We spend time getting to know your market, your message and your products before we ever sit down to create a site! 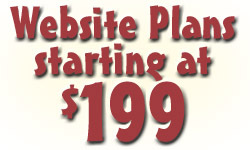 We offer custom web design services that fit your every need. No matter what your objective or the size of your organization - our custom web design services help you meet your goals every step of the way. Your site will be designed with your brand and identity in mind. Why try to fit your image into a template that simply doesn't convey your business message? We spend a great deal of time in assessing your organization's unique requirements. Then we proceed to create a design 'style' that will reflect the overall essence of your company. Have you ever received a web design proposal without ever speaking to a member of the design team? At BITS, we realize that your website is a reflection of your brand and corporate identity. Therefore, we feel it is essential to collaborate and work closely with you in creating your web presence. After all, you know your business best and we take the time to learn about your business and what you want your web site to do for you. We refuse to use low quality clipart, flashing animations or scratchy images! We believe that design elements placed on a page should never overpower the message but enhance it. Our custom web design services include professionally scanned, cropped, color-corrected and web-optimized images to provide your website with stunning graphics and photos to promote your site, your products and your business message.